When a business heavily invests in its own internal mailing system, address printers are one of the most essential investments among postage mailing machines and office mailroom equipment. Imaging accuracy and output is very important when shopping for address printers, and this aspect can only be obtained by acquiring a high-quality address printer. There are many established brands and models that can be found on the market for address printer machines, however quality is something that must not go overlooked. In every situation there are exceptions, even it comes to address printing products - but among the leading brands that a business should consider, Neopost, Rena, and Secap are known to deliver top level and high professional work. Neopost address printers are innovatively made and the result of this is that these line of printers are able to produce highly flexible, accurate and personalized envelopes which do have an amazing visual appeal. The other aspect which does give Neopost address printers their competitiveness is their ability to address high speed printing (i.e. able to produce 14,000 pieces per hour); a factor which is highly critical in ensuring that clients’ needs get to be addressed right on time. Neopost address printers are capable of producing logos, bar codes and high quality graphics which can be placed any preferred position on the envelopes. In addition this line of address printers allows for highly complex jobs to be easily managed as all the details that needs attention are concisely displayed on the LCD screen. There are various Neopost address printer models that businesses can opt for and some of the most popular ones are Neopost AS-710, AS-960 and SA50. Many small and medium scale mailers would find Secap models to be ideal for their business demands. Secap address printers have a production capacity of up to 7,000 pieces on hourly basis, graphic quality of 600dpi. Secap models are extremely easy to use as the only kind of setup need to make a connection is to use Ethernet or USB for faster downloads rates. Printing using the light mode allows for less ink to be consumed and the drying up time is also very short. Multiple printouts can be made without the need of making changes to the printer setup. Besides the internal font type, others can be downloaded and this implies that a wide range of designs and patterns can be made on envelopes. There are many models to this brand of address printers and the most popular ones do include Secap SA500, SA3100, SA300 and many others which do guarantee quality. Rena is worth a mention especially if you would prefer dealing with low capacity mailing systems. 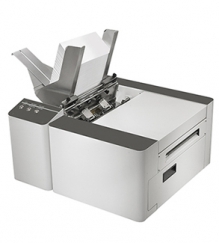 Rena address printers are known for their user-friendliness and do setup at a superfast speed. The system’s feeders are capable of holding about 300 envelopes per given time and if you are comfortable with production speed of 4,300 pieces per hour then Rena is just right on the spot. The print quality comprises 4 levels and this is available in 1200dpi and 600dpi which are further classified based on their respective resolutions. If you would like to own a Rena address printer for your mailing needs then you should consider having a look at popular models like the Rena DA-608, 607 and DA590. To find these brands of address printers for sale, check out WalzEQ.com, one the leading suppliers of address printers and mailing machines in the U.S.